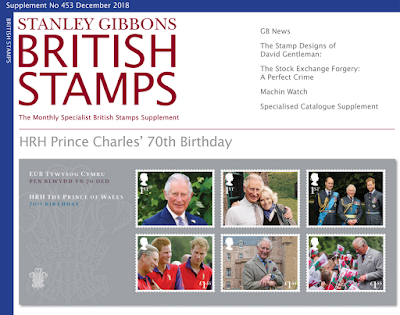 70th birthday of HRH Prince Charles, miniature sheet 14 November 2018. Although we have not had time to add all the details of the Harry Potter stamp issue here, most people will have seen it on the Royal Mail website. 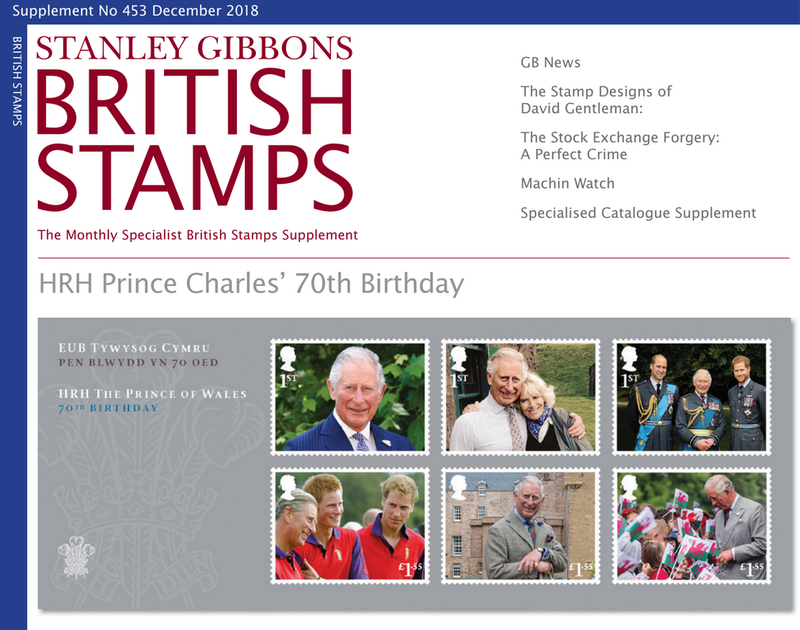 The website also shows the 2018 Year Pack, which the last issues of the year on the top sheet in the folder image, including the first pictures of the miniature sheet for the 70th birthday of HRH Prince Charles. Thanks to a reader for pointing this out. We are not able to show the whole sheet, FDC etc until the date of issue. I'm sure this is already in many Post Offices, but being a miniature sheet the chances of early usage are minimal. UPDATE: We've been reminded by Royal Mail that we are not supposed to show you that picture, which has now been removed from their own website. So instead here's another one, taken at a Post Office, showing the presentation pack already on display and being offered for sale. UPDATE 10 NOVEMBER - Embargo over. 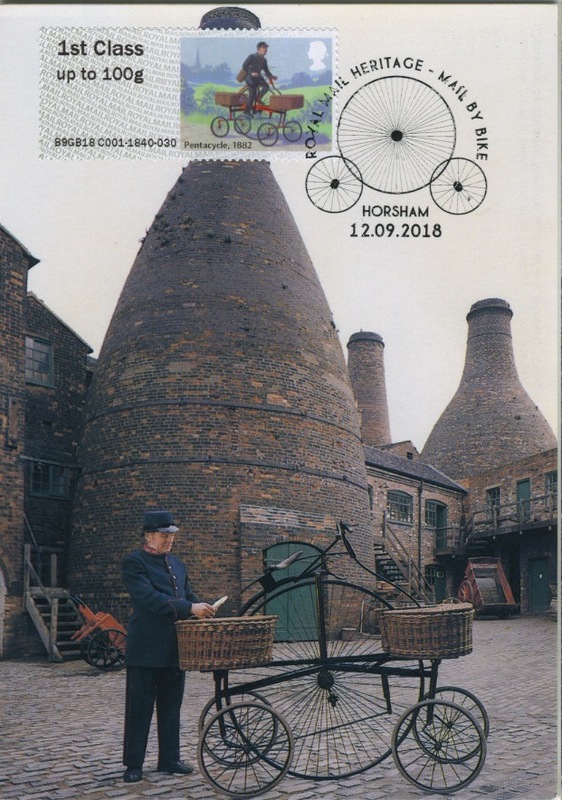 And here is a large version of the pre-print mock-up of the sheet, as provided by Royal Mail and as now in their online shop (click on it for the giant version). Nice pictures, and the group in military uniform has not been published before, which must be why the secrecy. 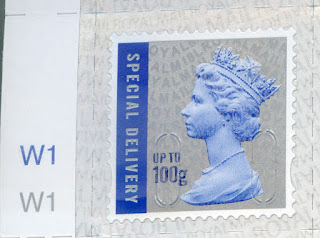 For more details and individual pictures I direct you to Commonwealth Stamps Opinion Blog! Ultra-violet lamps for detecting phosphor and fluorescence. A number of people have asked about what lamp to use to detect the phosphor and fluorescent variants on Walsall-printed Machin stamps. 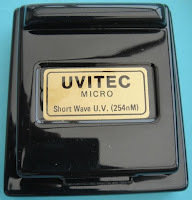 If you can find a Uvitech Micro, then I would recommend that as the one that I have been using, and through which I have taken all the UV stamp photos shown in earlier blogs. Unfortunately Ramley stopped making those decades ago. 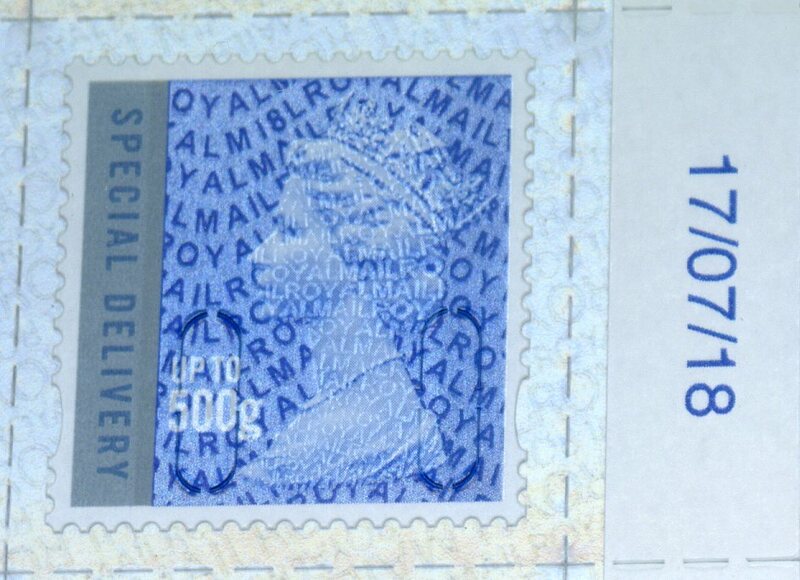 They occasionally crop up on eBay and other sites, and it is possible that you may find one in an old-fashioned stamp shop (where the dealer has stacks of stuff that he has forgotten about), or in local general (house-clearance) auctions. However, that is very hit and miss. The other thing to check is the switch mechanism; this is not a toggle switch, at least not on mine, and works by depressing a copper strip against a terminal. Again, over time, this gets worn. My strip is held in place by some self-adhesive sheet edging, being the right size and much easier to use than transparent adhesive tape. It works reasonably well in daylight, good enough for a quick look at phosphor bands, to look for short bands, etc, or just to check the colour. This is because it has an aperture through which the eye can see the lit stamp in relative darkness. But where the phosphor bands are glowing brightly, it is easier to see fluorescence on the iridescent ink or colour ink if you workplace is in total darkness. 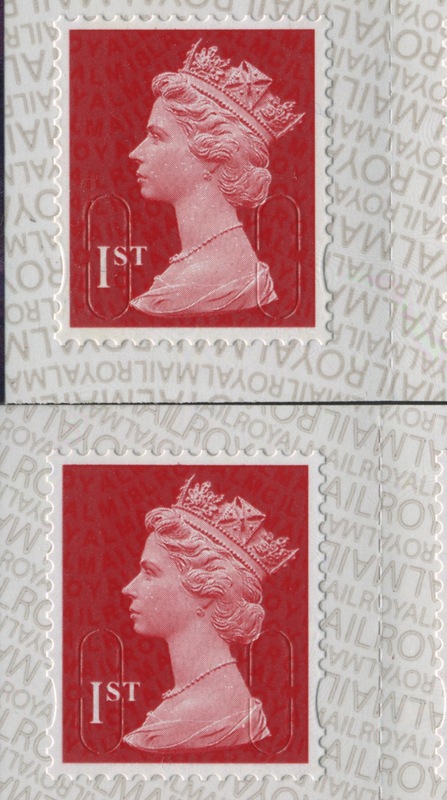 With the main room light off, dimming the computer screen and brightening it again generally provides sufficient darkness and light to see the effects (and take photos), and then to select different stamps. The model was also sold branded as Stanley Gibbons in the UK, and Scott in the USA. All the photos I have shown are taken with an iPhone, the newer the better although my previous models have produced acceptable results as shown on the blog in past years. The camera is in one corner, rather than centralised which probably helps. I'll be happy to add reports of your experiences with other phones or cameras. 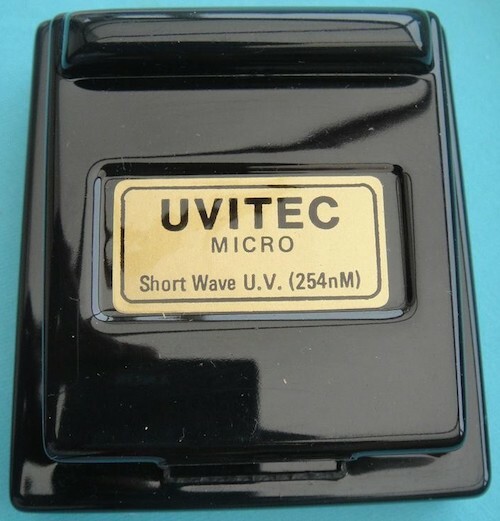 Ramley also produced the Uvitech Minor, a smaller mains-operated lamp which, while useful for detecting phosphor band colours (on Wildings especially I understand) does require total darkness. Both these lamps are short-wave only and use 254nm light wavelength. This is important. BUT WHY GO ON THAT HUNT WHEN OTHER LAMPS ARE AVAILABLE? Because I have no experience of them, so can't tell you more than I can find by research! Stanley Gibbons sell a dual-wave lamp for £119 which uses short and long-wave light. This is the one that John Deering uses for his reports in Gibbons Stamp Monthly. This also has an eye-piece and is battery operated. However, SG's website does not indicate the wavelength although it obviously works. Another user has declared it to be 'temperamental'. Maybe new batteries are needed! Update: I have been told by Gibbons that "the spectrum covered is 254 to 390nm which I believe is the longest range covered by any UV lamp on the market." Gibbons also sell the SAFE Philalux, which incorporates a magnifier and is also a banknote tester. 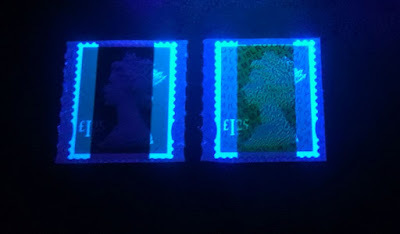 The lamps are "Shortwave 266nm with phosphor filter (for identifying phosphor bands and 'all over' phosphor on Great Britain stamps) and Longwave UV lamp 365nm (for identifying fluorescent paper, inks, forgeries and repairs)". I don't know whether this works for the stamps now available. A portable lamp with the PRINZ branding is also available for less than £15. This is battery-operated and therefore portable, but is long-wave 366nm, and so not suitable for our current purposes. PRINZ also have a 254nm short-wave lamp for under £30 which ought to work. I was shown a PRINZ lamp at a recent stamp club meeting which was useless for identifying the Walsall variants, so I assume it was the long-wave one. If the short-wave one does the job, it would seem to be the cheapest option on the market at present. If you look at their full range, they also have separate mains short- and long-wave lamps, and sell replacement bulbs should failure occur. They also have a selection of lamps with Lindner branding. Only the Gibbons dual-wave has the eyepiece and so can be used in daylight, and probably used for taking photos. I'll be happy to add any feedback and experiences from readers. Whilst my lamps don't actually have the designation 'Patent Pending', unlike my (grandfather's) original SG Instanta Perforation Gauge, they are very old but they work. Your reports on more modern equipment will be welcomed by other readers, I'm sure. Good luck! - my old Long Wave 'Philatell' model bought in 1970 for testing 'Woodfree' Paper on CW stamps and papers on the high value postage dues of the late 60's. This latter item is unquestionably long wave and is incapable of finding the afterglow on violet phosphors. 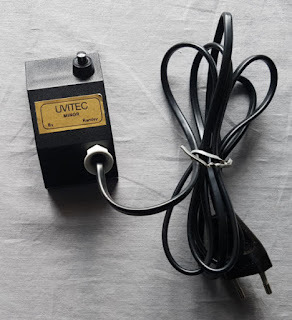 1) Uvitec - obviously no result as it's broken. 2) The Prinz Longwave - No yellow activation. 3) The 'Money Detector Short Wave - very poor yellow on stamps but not every time. 4) The Philatell Long Wave light. I never expected anything from this and only checked with this for 'a bit of fun'. The stamps were in Hawid Strips and the page covered by a Venus Protector but there it was - a really strong glow which would have been good enough to photograph. A was talking to Jim Bond on Friday afternoon and he has had a similar experience. He has had his best reaction with one of his Long Wave lights. I think we all know that some lights give different results to others.The message here is clear, different makes of lamps can have different performances. So, summing up, before going out to buy an expensive short wave lamp to detect 2018 Yellow Fluors you should test the reaction on all your Long Wave UV Lights. What really surprised me was that this reaction showed through the Hawid strip. So if you can, test before you buy, with some known different stamps - if you have the dated examples or cylinder positions that would be most useful. 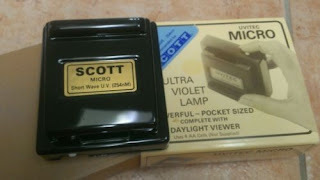 Reader DG has sent details of his US-retailed UV lamp, which has both Long Wave and Short Wave lamps. As he writes, one disadvantage of this is that is mains-powered so no use for shows and fairs. Now that I have once again, used my UV light to verify a distinct difference in the two printings of the £1.25, I thought that perhaps I should identify the lamp which I have been using with great satisfaction for over 20 years. I have 2 other hand-helds that I admit, do not produce the same results. Made in the US, it is labelled as a RAYTECH ULTRAVIOLET LAMP, Model LS-2, and has 2 distinctly separate lenses. It is 7½ inches long. 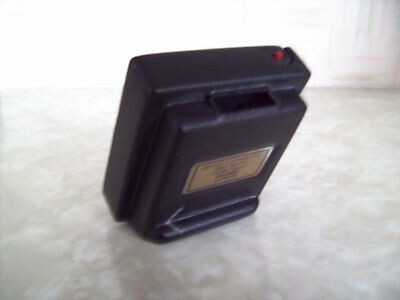 As you can see from the picture, it has the European Certification [CE] mark, but the only ones I could find on the internet were US-made 115 volt, so no use in the UK. Poppies will be or have been distributed to Post Office branches for installation and use from today (23rd). There is a new printing with R18YAL year code, but branches will probably use up old stock first, so it may be possible to get strips with two different dates from the same branches. The Poppy stamps will be in use at the Postal Museum, but not in any of the other museums. This includes all the military museums. Blank strips of the R18YAL printing have already appeared on eBay. These designs will make a reappearance at Post Office branches and probably at the Postal Museum, though the latter has to be confirmed. A new printing is expected. Blank strips of the 2017 and 2018 printings have already appeared on eBay, coded R17YAL or R18YAL on the 1st and CL17S or CL18S on the 2nd class. (2017 version shown here). We think these should be installed after the poppies are removed on 31 October, but see update below. It's been pointed out to me that the Poppies ought to stay on sale until at least Sunday November 11th, Remembrance Day. UPDATE 1 November. Postal Museum have announced today that "the Royal Mail Post & Go stamps featuring Winter Greenery designs will be available from its Post & Go machine from 8 November 2018, not 12 November as reported elsewhere. 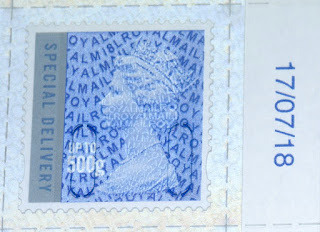 The stamps will replace the Machin 1st and 2nd class designs with the ‘F’ Box 50 overprint." (See below for clarification of the F-Box situation). 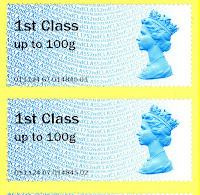 Meanwhile DF continues to report a lackadaisical attitude at some PO branches about what can and can't go where in Self-Service Kiosks, providing this example of the 2nd class stamps being used in the 1st class position. This is the CL17S version. Also in the cabinet "I noted a full reel of Anniversary in the box and was told – 'oh! those ones can go anywhere'". Incidentally I'm told that PO Ltd contract with NCR is up for renewal and new machines may appear in branches next year. I'm not sure why this should be so if the old machines work well (although there are always problems in public-facing machines of any sort). Will this see a resurgence of interest in Post and Go, or be a further nail in the coffin? 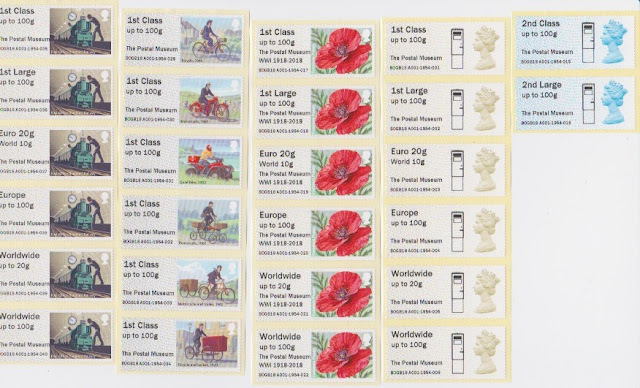 Poppies at Postal Museum are year coded15, those at Mount Pleasant and Islington POs are 18. At the Postal Museum the Machin designs reverted to the default inscription, but somebody forgot to remove the F-type Postbox illustration, so that was available for a short period on 23rd with the lower (normal) Postal Museum inscription. This error was corrected during the afternoon, I'm told, so these short-term errors will be worth having - if the buyers even noted them, in fact. The Machins are 15-coded. It always makes sense to test all the reels, one of our reporters did that and this is his picture. Thanks to DF and MC for the reports. UPDATE 2 November. It seems I misunderstood the 'correction' that was made during the afternoon of 23rd. Initially the F-box 50 inscription was omitted but the picture remained. I thought that the correction was to remove the picture, but in fact the inscription was restored as well. Thus when the Winter Greenery replaces the Machins on 8 November the Machins will still have the full F-box 50 inscription and logo. Thanks to Eliska Bejrova at the museum for the clarification. October Slogan Postmarks - Tyneside MC still in a different time zone. 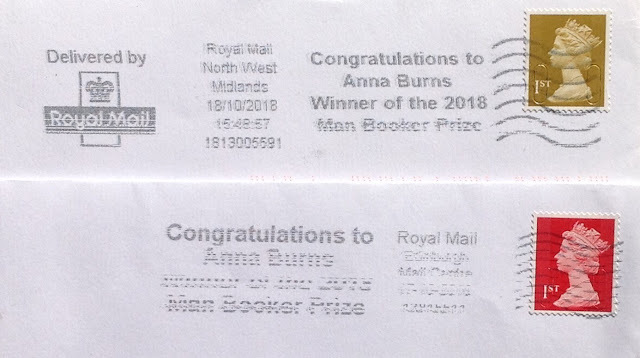 Slogans have picked up again in October, well there's at least one, as Royal Mail once again honour the winner of the Man Booker Prize for Literature. This year's winner is Belfast born Anna Burns' Milkman, which draws on Northern Ireland's 'Troubles' and is written with few paragraph breaks, and few characters. Examples of two layouts of the slogans shown here from Edinburgh on 17 October and North West Midlands on 18 October. Meanwhile Tyneside Mail Centre used the Royal Academy 250 slogan again in October (we had no reports of September use, but that doesn't mean that it didn't happen). That's had quite a run from it's June start! This example is for 8 October 2018. More slogans will be shown as reported by readers, so please keep them coming in. Just when we thought that the multiple variants of phosphor and fluorescence were making modern Machins too complicated, a further development has occurred which creates at least two more Machin variants. Can you spot the difference? You'll remember that when security printing was added to the booklet backing paper all the text was upright. And later, SBP2 appeared which has some lines inverted and can appear in two forms, which have various designations depending upon the club you belong to, the catalogue you use, or the blog you read. Well we had assumed that all the SBP1 paper had been used alongside the SBP2, but it seems that is not the case. Walsall still had at least one, probably more, rolls or part-rolls of SBP1. I'm told the intention was to use this on this year's Christmas booklets (which would certainly have created two versions of at least one of the booklets, given the huge quantity printed). Instead, the paper was used on books of 6 x 1st: specifically the MSIL padlock booklet which has appeared with SBP1 as before (and so is MB18 rather than MB18a), but with M18L for the first time (the M16L was also on SBP1). 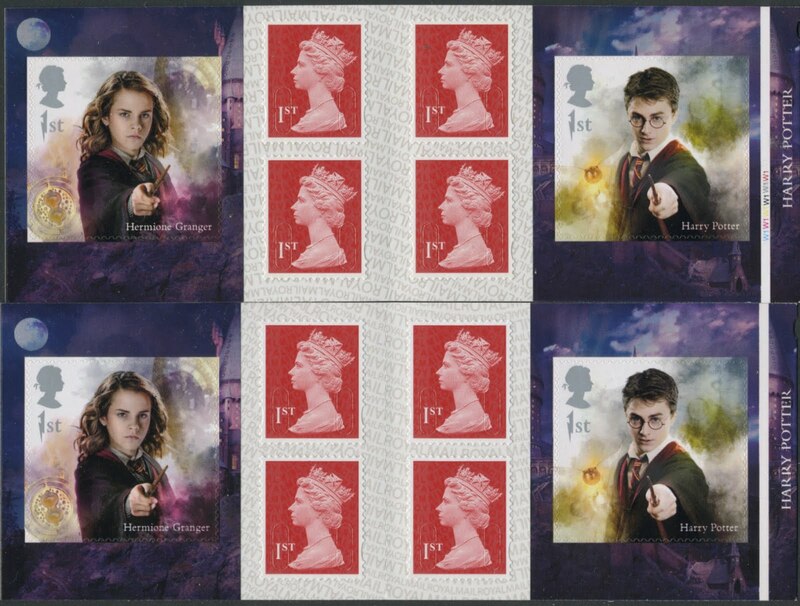 The other booklet affected is the Harry Potter mixed PM64. There are several odd things about the Potter booklet. Firstly, dealer supplies from Tallents House have been SBP2 as normal, while supplies in (at least some) Post Offices are SBP1. But the second oddity is that the SBP1 is inverted. As far as I can recall this is the first instance of SBP1 being used inverted. This should get a separate number in the Stanley Gibbons Concise catalogue: one of them at least will be PM64a. We have some stock of the Potter booklet but it isn't being added to our shop until existing orders are clear. The single 1st class Machin will be listed by us as 2936aC.8a with SPB1i. Any customer who has already written asking for out of stock stamps to be added to existing orders when available can ask for this to be added also. Likewise anybody paying by bank credit or cheque, but those who have already paid by PayPal, we can't add this single stamp and take payment for it as PayPal deductions would lower the price below face! Just email and we can put these aside for you. The question now, is, are there any more surprises awaiting discovery? 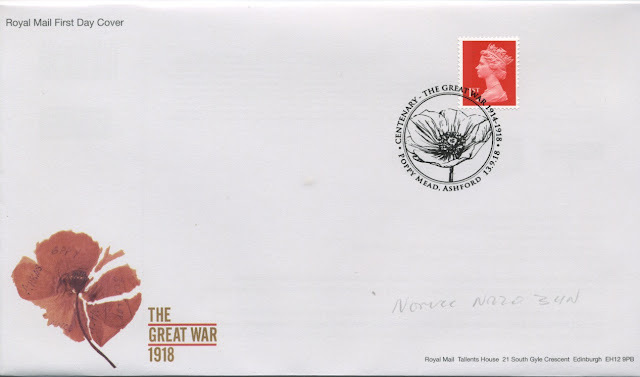 My thanks to JG for this example of the 2018 1st class Christmas stamp, due for issue on 1st November, with a Northern Ireland Mail Centre postmark of 16 October. Can anybody beat that date, or show early release dates for other values? Our office is closed from 13-22 October but the web shop will remain open. All new Machin definitives that we have been able to obtain have been made available, but stocks of some, particularly blocks, are low. If you wish to buy any recent additions which are shown as out of stock, please buy what you can, choose the 'pay by cheque' option, and email us with your further needs. That will ensure that what IS available is reserved for you. We will endeavour to obtain the remainder when we are back in the office. We will process all new orders as quickly as we can, and post as many as are ready by Friday 26th. UPDATE: Day 1 of our return will be devoted mainly to domestic and business administration and catch-up. If you have placed an order on the shop since 12 October, thank you - yours is one of 35 orders awaiting processing, and some of you have also written to ask for 'out of stock' items to be added. When we have opened the three packages that arrived from Royal Mail last week we will have a better idea of what we can fill (but one of these will be the Christmas stamps). Meanwhile, thank you for your continued patience and for those of you on school half-term this week, enjoy it while you can: this glorious weather can't continue! Last week on the Isle of Wight it was only 7º cooler than a month ago in Mallorca! 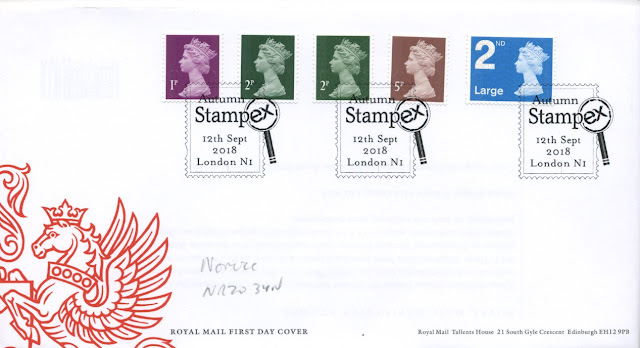 The number of basic definitive stamps (that is, without any fluorescent variants) still to come this year is going down all the time. 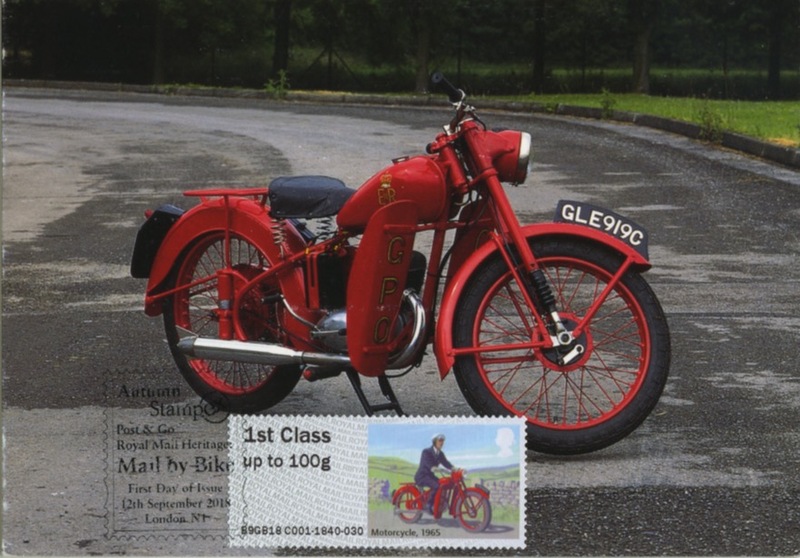 We are now able to show the two Special Delivery stamps and hope to have these in stock soon. These will be listed as 2985.8 and 2986.8 in our checklist. Both were printed on 17/0718 and have blue phosphor with no yellow fluorescence. 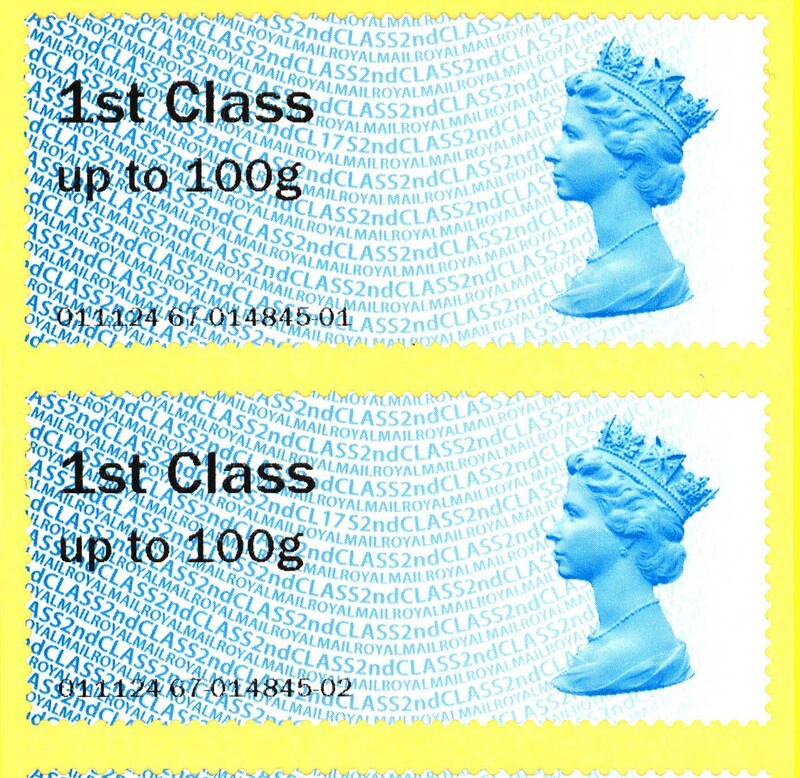 Readers tell us that Royal Mail will distribute these as non-visible change in December for those who have these on standing orders. Note that this is only because of the change of printer, not because the year date has changed.